(Beyond Pesticides, February 26, 2018) It is no secret that large organic dairy herds of 15,000 to 20,000 cows or more dot the Western US in California, Colorado and Texas in particular. They have repeatedly come under fire from watchdog groups, journalists and farmers who have observed and documented the absence of cows on pasture during grazing season, as required by the Organic Foods Production Act (OFPA). This circumventing of the law could soon change with the commercialization of the fluorescene spectroscopy (FS), which detects the amount of forage a dairy herd is eating by measuring the luminescence of metabolized grass in milk. The law requires that herds graze daily during a given region’s growing season, at least 120 days per year, and consume a minimum of 30% grass in their daily diet. 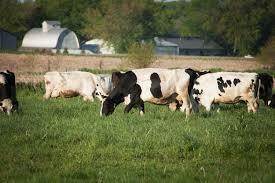 Until now, there has been no technology to scientifically verify that organic milk comes from grass-fed dairy cows. . The organic dairy certification system relies on visual inspections by certifiers during the grazing season and an evaluation of the dairy’s herd management plan.. While most organic dairies are in compliance, there are questions about the ability of the super-large dairies to meet stringent organic pasture regulations. The FS testing system could revolutionize organic diary production transparency with a scientific tool that reassures consumers that the organic milk and dairy products they consume meet the strict, minimum requirements of OFPA. When cows regularly graze on pasture, traces of chlorophyll from the grasses they eat and metabolize remain in their milk. When exposed to the light frequency of the FS, a bright and measurable fluorescent marker can be seen. Scientists at Iowa State University’s (ISU) Center for Sustainable Agriculture recently published a peer-reviewed study in the Journal of Agricultural and Food Chemistry that concludes that the FS reliably measures the amount of grass a herd has eaten. They explain how the results from using FS are instantaneous, the tests are inexpensive, involve only light and not chemistry, and they could be administered at the site of a dairy pick-up. Several exposés have uncovered how USDA has failed to enforce the National Organic Program’s pasture regulations on large dairies. A 2017 Washington Post article documents an eight day investigation of Aurora Organic Dairy’s Greeley, Colorado, plant where “signs of grazing were sparse. . .the number of cows seen on pasture numbered only in the hundreds. . .At no point was any more than 10 percent of the herd out.” To confirm the author’s observations, the Post sent milk samples to the Virginia Tech for lab testing, which confirmed that the “key indicators” of grass-feeding matched those of conventional milk. During that same year, organic inspectors arrived at the dairy in November, after the grazing season, so they had no way of verifying Aurora’s compliance with OFPA grazing requirements. Back in 2007, the Cornucopia Institute, an organic agriculture watchdog group, filed a complaint with USDA against the same company, arguing that it violated organic grazing rules. While USDA admitted that Aurora was in “willful violation” of OFPA rules, the agency agreed to a settlement and the dairy continued its operations. According to the Post article, little has changed at Aurora. Still, the government remains silent in the face of such flagrant violations. A former National Organic Standards Board (NOSB) member and owner of organic Radiance Dairy in Fairfield, Iowa, Frances Thicke, PhD, does not see how large herds such as those that supply milk to big box stores can meet USDA’s organic grazing requirements. “I don’t think that you can possibly graze 15,000 cow and milk them twice a day. It’s biologically, physically impossible to do that – for the cows to go out far enough to get grass and come back. That just can’t be done, because it’d be too far to walk. Besides, they’re on a desert.” Milk samples from his grass-fed cows wereused in the ISU study and they showed a high level of chlorophyll metabolites, which verify that the cows are pastured. Consumers expect that the organic milk they drink comes from cows that roam on pasture because it is good for the cows and for the people who drink their milk. Organically produced milk contains significantly higher levels of beneficial fatty acids than conventionally produced milk because organic farmers pasture their cows when grasses and legumes are growing. A 2014 study tested 220 organic and 164 conventional whole-milk samples from producers in 7 regions across the U.S. and compared their fatty acid content over an 18 month period. Their research demonstrated that organic milk contains 62% more omega-3 fatty acids and 25% less omega-6 fatty acids then conventional milk. Although omega-3 fatty acids are essential to human health, they are not naturally produced in the human body, so they must be obtained through food consumption. Omega-3s are also integral to healthy cell function and they have been shown to prevent heart disease and stroke. Conversely, excessive levels of omega-6 fatty acids, like those predominant in conventional milk, promote cardiovascular disease, autoimmune diseases, inflammation, blood clotting, and tumor growth. Clearly, from a health perspective, it is important to eat whole fat milk products made with milk sourced from grass-fed organic dairies. But, how can you be sure? While FS is still in the early stages of development because more testing on different breeds and cow diets is needed, researchers agree that a hand-held and consumer-friendly devise would not be difficult to develop, but they are not there yet. In the meantime, it is critical for you to educate yourself about the most authentic and trusted organic dairy producers at the grocery stores where you shop. Buy local from a dairy farmer you get to know and trust. If you aren’t sure, ask your neighbors and colleagues who are their go-to dairy companies. Investigate the plant codes on milk containers so you can avoid mega-organic dairies like Aurora (08-29). Choose a recognized name brand over generic brands and store brands from mega stores like Walmart, Target and Costco, who tend to source their milk from large organic dairies to accommodate the large volumes they sell. Don’t buy the cheapest brands because they don’t pay farmers a fair price and they are likely stretch the rules for compliance with OFPA. Most importantly, don’t give up on the organic label. Organic’s system of regulation, inspection, and third party certification is still the most transparent food system we have and the most beneficial for human health and the environment. Check-out Beyond Pesticides’ Eating with a Conscience website to learn more about the many benefits of organic food production for consumers, workers, and rural families. To advocate for organic integrity and the protection and strengthening of organic standards, see Beyond Pesticides’ Keeping Organic Strong webpage. This entry was posted on Tuesday, February 27th, 2018 at 12:00 am	and is filed under Agriculture, Alternatives/Organics, National Organic Standards Board/National Organic Program, Uncategorized. You can follow any responses to this entry through the RSS 2.0 feed. You can skip to the end and leave a response. Pinging is currently not allowed.